The Patuxent Range or macizo Armada Argentina is a major range of the Pensacola Mountains, comprising the Thomas Hills, Anderson Hills, Mackin Table and various nunataks and ridges bounded by the Foundation Ice Stream, Academy Glacier and the Patuxent Ice Stream. Discovered and partially photographed on January 13, 1956 in the course of a transcontinental nonstop plane flight by personnel of U.S. Navy Operation Deep Freeze I from McMurdo Sound to Weddell Sea and return. Named by Advisory Committee on Antarctic Names (US-ACAN) for the Naval Air Station Patuxent River (at Cedar Point, Maryland) located on the south side of the mouth of the Patuxent River. The range was mapped in detail by USGS from surveys and U.S. Navy air photos, 1956-66. O'Connell Nunatak (84°43′S 65°8′W﻿ / ﻿84.717°S 65.133°W﻿ / -84.717; -65.133) is a peaked rock nunatak, 1,210 m (3,970 ft), standing 6 nautical miles (11 km) south-southeast of Mount Murch in the southern Anderson Hills. Named by US-ACAN for Richard V. O'Connell, seismologist at Amundsen–Scott South Pole Station, winter 1967. Shurley Ridge (84°54′S 65°23′W﻿ / ﻿84.900°S 65.383°W﻿ / -84.900; -65.383) is a partly snow-covered ridge projecting from the southwest side of Mackin Table, 10 km (6 mi) southeast of Snake Ridge. Named by US.ACAN for Jay T. Shurley, biologist at Amundsen–Scott South Pole Station, summer 1966-67. Mount Tolchin (85°06′S 65°12′W﻿ / ﻿85.100°S 65.200°W﻿ / -85.100; -65.200) 1,730 m (5,676 ft), stands 8 km (5 mi) southwest of Houk Spur at the southwest extremity of Mackin Table in the southern end of the range. Named by US-ACAN for Lt. Sidney Tolchin (MC) U.S. Navy, officer in charge of the Amundsen–Scott South Pole Station in the winter of 1959. Mount Warnke (84°20′S 64°55′W﻿ / ﻿84.333°S 64.917°W﻿ / -84.333; -64.917) 915 m (3,002 ft), stands 5 km (3 mi) NE of Martin Peak in the Thomas Hills. Named by US-ACAN for Detlef A. Warnke, biologist at Palmer Station, 1966-67. Mount Yarbrough (84°24′S 66°0′W﻿ / ﻿84.400°S 66.000°W﻿ / -84.400; -66.000) is a ridge-like mountain, 865 m (2,838 ft), standing 3.2 km (2 mi) southwest of Nance Ridge in the Thomas Hills in the northern side of the range. Named by US-ACAN for Leonard S. Yarbrough, industrial engineer at Plateau Station, 1965-66. ^ Nomenclador Antártico Argentino Id 100128. 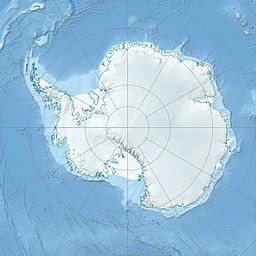 SCAR Composite Gazetteer of Antarctica. ^ a b "Patuxent Range". Geographic Names Information System. United States Geological Survey. Retrieved 2004-11-03. ^ "O'Connell Nunatak". Geographic Names Information System. United States Geological Survey. Retrieved 2008-07-22. ^ "Shurley Ridge". Geographic Names Information System. United States Geological Survey. Retrieved 2008-03-11. ^ "Mount Tolchin". Geographic Names Information System. United States Geological Survey. Retrieved 2005-09-30. ^ "Mount Warnke". Geographic Names Information System. United States Geological Survey. Retrieved 2010-03-31. ^ "Mount Yarbrough". Geographic Names Information System. United States Geological Survey. Retrieved 2008-03-20. This page was last edited on 15 May 2018, at 00:41 (UTC).